William Ernest Juhnke was born on January 24, 1912, a grandson of Mennonite immigrants in McPherson county, south-central Kansas. His parents were Ernest and Alvina Kaufman Juhnke. His first name, William, was an English form of the German name, Wilhelm. William's immigrant grandfather was Carl Friedrich Wilhelm Juhnke, born in 1841. Grandpa Carl had been named after a long Prussian royal line of Friedrich Wilhelms. Ernest and Alvina, in their German-American home three-fourths of a century later, called their son by the more familiar "Willie." Ernest and Alvina Kaufman Juhnke had been born of immigrant parents, all German-speaking but from different parts of Europe. The Juhnkes had come from Farther Pomerania, a province which became a part of Prussia and of northern Germany. They belonged to the German evangelical church. The Kaufmans had originally come from Switzerland, but they had moved to the east European province of Volhynia by the time of migration to Kansas in 1874. They had been part of a cohesive Amish community which joined the Mennonite denomination in Kansas. The Juhnkes and Kaufmans both spoke German, but in quite different dialects. The Swiss-Volhynian dialect, which tended to dominate in the predominantly Mennonite community, had much in common with the dialect in the Palatinate, a south German province. It had a more rhythmic musical bounce than did the north German dialects. Alvina Kaufman was the oldest child of Napoleon and Freni Stucky Kaufman. She first got to know Ernest when she came to help with housekeeping for the Juhnke family. Ernest's mother had died in 1899, when Ernest was twenty years old. Ernest had been baptized as an infant in 1879 in Knox County, Nebraska. In 1904, before marrying Alvina, he had to be rebaptized as an adult. Alvina's father, Napoleon Kaufman, who bore an interesting given name for a Mennonite pacifist, was the elder of the Hoffnungsfeld Mennonite congregation. He would not have approved his daughter's marriage to a man who had not received believer's baptism. Ernest not only joined Alvina's church, but he accepted her leadership in other ways. In those patriarchal times women often exercised influence informally. There is evidence that Alvina was a strong force in the Juhnke family in many ways. She had special interest and concern for the education of her children. When Willie enrolled at Bethel College in 1935, he wrote on the application form that his grades should be sent to his mother. Willie's father was a tough and hard-working man, but also fun-loving. He had lived as a bachelor several years before getting married. He and his good friend Daniel Waltner performed a song and jig routine to entertain "Literary" meetings at a local public school. Willie eventually learned a homely jig of his own to amuse himself and his family. His impulse to play the role of entertainer was an inheritance from his father, at least in part. The Juhnke men were more inclined to "horsing around" and telling off-color stories than was the Goering family into which Willie married. Church attendance at the Hoffnungsfeld Mennonite Church was important for the Juhnke family. Sunday mornings at church included two separately organized activities--Sunday school and worship. The Sunday school curriculum followed a sequence of Bible studies prescribed by the national American Sunday School Union and designed to cover the main stories and themes of the Bible in a seven year cycle. The Sunday School imported American influences into the German-American community. It promoted the English language, revival-type songs, and a mainstream evangelical theology which was different in some ways from traditional Anabaptist-Mennonitism. From his volunteer Sunday School teachers, as well as from the sermons by untrained Mennonite pastors, Willie received a strong education in Bible knowledge. The church also celebrated special seasonal events such as Christmas and Easter. In the summer of 1917 the church set up a big tent for a large crowd to attend the ordination of Ed and Hazel Dester Kaufman who were going to China as Mennonite missionaries. The church was the social center, as well as the religious heart, of the community. In 1895 there was a division in the Hoffnungsfeld church over a problem of leadership succession. One group left and built another church a half-mile to the east and called it Hoffunungsfeld-Eden. The Kaufman and Juhnke families stayed at Hoffnungsfeld, where Napoleon Kaufman was elder. Their preference was strengthened in 1899 when Ida Juhnke's fiancé, Christian J. Goering, a young leader of the Hoffnungsfeld-Eden group, broke the engagement. The Juhnke family was humiliated. They were still outsiders in this close-knit Mennonite community, not quite on the same level with the Stuckys, Schrags, Grabers, Goerings and others who had been in the Swiss-Volhynian 1874 migration from Polish Russia. In 1899 in that community, broken engagements were more scandalous and less frequent than broken marriages a century later. Willie was born in the Juhnke home shared with Grandfather Carl Juhnke on section two of Turkey Creek township, just two and a half miles northwest of the place where Meta Goering, his future wife, was born four years later. (Community map showing Carl Juhnke and Jonas Goering farms) When Willie was two years old, his father sold the eighty acres he had inherited from grandfather Carl Juhnke, and bought 120 acres about three miles to the north, in King City Township. Ernest purchased this land for $10,000 from his father-in-law, Napoleon Kaufman, who had bought 360 acres from A. G. Smith in 1901. It was, as Ernest wrote in a letter to a friend in Nebraska, "good bottom land." The Mennonite family network worked well to get the Ernest and Alvina Juhnke family started in farming. The new Juhnke farm land came to have an emotional hold on Willie from his childhood until his death in 1991. (Farm map ca. 1925) The 120 acre plot was bisected diagonally by two lines--one of natural curves and one of a man-made straight line. The first was the Dry Turkey Creek (listed as the "Turkey Creek" on some early maps). The creek entered onto the Juhnke land from the northeast and twisted its way across the low pastureland, departing to the southwest where it eventually joined other tributaries to form the Turkey, the Little Arkansas, the Arkansas, and, finally, the Mississippi River. Along the Dry Turkey's banks were pasture lowlands with many trees--ash, oak, elm, walnut, cottonwood, mulberry, acacia, and osage orange. Each tree type had its special virtues, but the acacia trees with their long sharp spines seemed to lack a clear reason for existence--especially for a barefoot boy who stepped on them while bringing the cows home for milking. The lowland pasture and creek, were home to all manner of wildlife--occasional white-tailed deer (but no antelope as promised in the Kansas state song "Home on the Range, where the deer and the antelope play"), rabbits, turtles, carp, catfish and crawdads. Part of the pasture was an open meadow bounded by large shade trees, an area perfectly suited for family and church picnics. But the Turkey Creek was not always benign and invitational. Heavy spring rains could turn it into a raging torrent, overflowing its banks and destroying crops on the flood plain. Once Willie and his younger brothers were wading along the edge of the flooded creek and young Carl Oscar stepped across the bank and slipped in. As Carl hung onto some grass on the edge, Willie grasped his hand and pulled him out. The second dominant line on the Juhnke land was the Missouri Pacific railroad, which entered the farm from the southeast and headed northwestward with apparent singleminded purposefulness all the way, as far as young Willie knew, to the Pacific Ocean. The Missouri Pacific engineers were friendly and waved back to Willie when he greeted them from the prairie hay field south of the tracks or field "south of the house," which was most often planted to hard winter wheat. Sometimes the noisy train could inspire great fear, as on one day when Willie was getting the cows from across the creek and dared to walk (and then run) his way ahead of the oncoming train across the railroad bridge over the Dry Turkey. He had misjudged how fast it was coming and the shrill whistle of the onrushing train gave him the scare of his life. Almost as frightening were the stories about the spirits at "Ghost Bridge," where the Missouri Pacific crossed the Running Turkey Creek (sometimes called Spring Creek) a half mile straight south of the farm. The dirt mile road for cars curved under the railroad and then doubled back like an "S" to cross the creek. It was a perilous task to maneuver horses pulling racks loaded with prairie hay from the "field behind the tracks." On at least one time the workers stacked the hay too high and had to restack it when it didn't pass under the bridge. In the spring of 1915, when Willie was three years old, a census-taker from the Kansas Agricultural Survey came to do an inventory of the Ernest and Alvina Juhnke farm operation. The census record showed that the Juhnkes were farming 160 acres. Most of it was planted to winter wheat--115 acres. There were fifteen acres of corn, ten of oats, twenty of pasture, and a quarter acre of Irish potatoes. Eight horses and one mule provided the power for field work. There were three milk cows and the family estimated it had made fifty pounds of butter in the previous year. It was not a large farming operation, but it provided year-round full-time work for Ernest and Alvina. The parents assigned farm work for the children as soon as they were able. The land was productive and the prices for farm products reasonably good. In 1914 a war broke out in Europe (later known as World War I, 1914-18). The war raised the price of wheat just after Ernest had made his investment in good wheat-producing land. 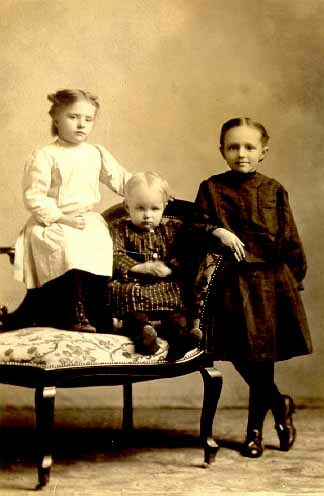 Anna, Willie, and Emma Juhnke in 1914. As Willie grew up, his father put him to work on outdoor tasks as soon as he was capable. As the oldest son, he always knew he was highly valued. For women's work in the kitchen and indoors, the Juhnke men depended on Alvina, Emma, Anna and the girls who came along later. Willie learned little about cooking and housekeeping. It was a hard-working family. Except for Sundays, a day for attending church worship, for resting, and for visiting extended family, the Juhnkes worked from dawn to dusk. To some extent the work load was seasonal. Winter brought shorter work days and longer nights for sleeping. The Juhnke farm fronted directly onto the township section road a mile east and a quarter south of Elyria. The homestead land sloped downward to the northwest, where the creek ran just a stone's throw from the far end of the big barn. Ernest originally had moved in an older barn to a location near and parallel to the road. This granary-barn served to shelter animals as well as to store wheat and oats. In about 1923 Ernest built the bigger barn with a hayloft and a triangular front overhang to raise up the hay with slings. The horses pulled up the hay with a very long rope which ran along a pulley at the back floor of the barn, up to near the top roof ridge, across the full length to the front of the triangular overhang, and then down to the slings with the hay. As the horses pulled, the hay-loaded slings went straight up to the hayloft level, then into the barn along a track near the top of the roof. Finally a worker tripped the slings loose and the hay fell into place on the loft. Human power pulled the slings back to their original position. Lifting the hay to the hayloft was a great drama in its own right--though perhaps not as exciting as wheat harvest or hog butchering. More of a burden was the daily winter work of feeding the cows and horses by tearing the matted hay loose with a pitchfork and throwing some down the hayloft openings next to the walls. It was important to have the hay elevated to the loft, because the barn itself was subject to flooding from the Dry Turkey Creek.